Latest UFO sightings – Cigar-shaped UFO photographed over Delta del Pro, Italy on Tuesday, 20th April 2010 during the day. LUS 2010 – most recent UFO sighting reports and evidences. Real UFOs on net from Europe, ovni Italia. 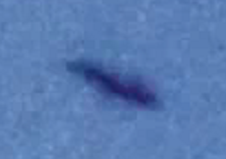 Cylinder-shaped daytime UFO new footage.